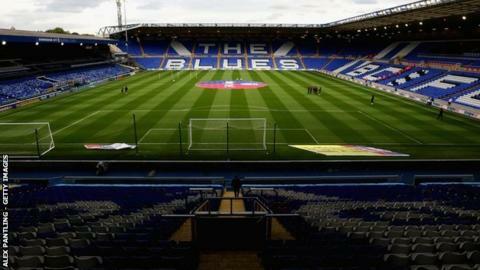 Two national newspapers report that Birmingham City are to be sanctioned. Blues, currently 20th in the second tier having failed to win in eight games this season, have opted not to comment. The club revealed prior to the start of the season that, on issues relating to regulations on profitability and sustainability, they could not sign players because of a transfer embargo. However, they were given permission by the EFL to sign five more loan players and they are now working closely with the EFL to follow the business plan set out. An EFL spokesperson said: "The EFL presented to Championship clubs the sporting sanction its board would be seeking against any club found to be in breach of its profitability and sustainability rules. "This included a points deduction, with reductions available dependent on the level of the breach. Aggravating factors will also be taken into consideration, resulting in potential further punishment. "Any final sanction will remain a matter for an independent disciplinary commission to determine, who have a full range of penalties available to them. "Clubs found to be in breach and referred to a commission will be given the opportunity to put forward their case in mitigation." My understanding is that Birmingham City are not reading too much into reports suggesting they may get a 15-point penalty for a breach of profit and sustainability regulations. The club continue to work with the EFL to demonstrate the reasons for the over-spend and the measures in place for a more sustainable project moving forward. While the signing of Kristian Pedersen is being presented in reports as an "aggravating factor", Blues have pointed out that they showed restraint during the January window this year. Any final decision on a punishment will be made by a panel which is yet to be convened. So the story will clearly rumble on.